Save the date! WASBA invites you to join us for a reenergized annual conference in 2019. The one day, Pacific Northwest Beekeeping Conference, will be held February 9, beginning at 8 AM on the campus of Eastern Washington University in Cheney, WA. Two speaker tracks include a science track and a hobby track. Our keynote speaker is Sara Red-Laird, AKA The Bee Girl. Enjoy social time chatting with other beekeepers and shop vendors. $10 for WASBA members, $35 for non-WASBA members. Registration info at EventBrite. For other information contact Jenifer@wasba.org. WASBA has added a fantastic social event that takes place after the conference. We’ll gather for appetizers, mead and social time beginning at 6:30 PM at the Mason Jar, located at 101 F Street in downtown Cheney. The Bee Girl will be joining us along with other speakers so you will have an opportunity to visit it with them one-on-one. Holiday Inn Express & Suites Cheney at 509-235-1100. 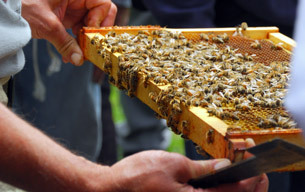 Mention the “Beekeeping Conference” group discount to receive a rate of $109+tax in a Single King or Two Queen room. I appreciate the effort WSBA to reenergizing the annual beekeepers conference, but unfortunately due to the distance of travel and the short duration of the meeting I will not be able to attend. I am and have been a member of Mt. Baker Beekeepers Association for many years and have always attended previous conferences. I hope there will be a great number of attendees and please consider a late summer two day conference somewhere on the middle of the state. The passes could be crazy in early February.